What materials are available to take your Sunday school lessons to the next level? 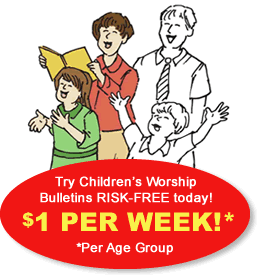 Our Children's Worship Bulletins are jam-packed with fun and engaging pictures, mazes, codes or other puzzles. Each activity teaches Scripture knowledge in a fun and engaging way. Use the bulletins as written or use them to spark your own creativity for other activities. You'll always find materials to take your Sunday school lessons to the next level. In this short article, we've included two examples of Sunday school activities about the Old Testament story of Daniel that you can use with our Children's Worship Bulletins. See for yourself how fun they are! Distribute the crayons/colored pencils and a bulletin to each child. Explain the activity, "First, find the eight differences between the two pictures of King Nebuchadnezzar giving praise to the God of Israel. Then, draw the objects missing in each picture so that both pictures look the same. Finally, color the pictures." When the children are done, give them the opportunity to show the class their finished pictures. Read aloud Daniel 3:1-30 to reinforce the lesson. Sunday school activity about Daniel for ages 7-12: What did Daniel say the writing meant? Distribute pencils/markers and the bulletin to each child. Explain the object of the game, "The goal is to be the first team to solve the puzzle and to create new pictures for each letter represented in the puzzle. For example, instead of a picture of a hat for the letter 'H,' draw a horse or another object that begins with the letter 'H.'" Read aloud Daniel 5:1-30 to reinforce the lesson.